It has been suggested in at least one homeschooling book that Canadians adapting an American curriculum should simply substitute an appropriate book of Canadian history. If it were only that easy! Particularly when using a literature-based curriculum, with several threads of history being taught, it is difficult to single out the places where substitutions need to be made. Where does American or British history stop being relevant to Canadians, particularly if that history includes our own family stories? Or is it less a matter of what non-Canadian events or personalities we choose to include, and more a problem of communicating what our own country looks and feels like? And it looks and feels different depending on where in Canada we are! Our regional interests affect what we want to cover in depth, and there are even some francophone AmblesideOnline users whose needs are different again. Over several years of CMCanada posts, one other significant problem has emerged, and that is the question of out-of-print books. Many of us have discovered out-of-print history treasures, including older school textbooks, and have used them with our own children; but we hesitate to recommend them to everyone, because of the differences mentioned above and because of their limited availability. There are also many new resources for Canadian studies; Canadian homeschool catalogues carry a wide variety of historical novels and study guides. However, many of them do not fit well with Charlotte Mason's methods, or they don't meet the literary standards of the main AO curriculum. So while it is impossible for us to recommend one official Canadian version of AmblesideOnline, we would like to suggest some worthwhile books that could be used for different AO years in the areas of history, geography, biography, and literature; and we'd also like to point out that there are many other places where Canadian culture and identity....however you define them...can be incorporated into the curriculum. We would also like to encourage you to look at online possibilities, particularly e-texts. Lori B, a longtime CMCanada subscriber, has collected and formatted a number of history and literature books that could be used for school reading; she is planning on making them available through Yahoo Groups. (Please see CMCanada at Yahoo Groups for more information on this.) Lori has also typed and uploaded a series of Canadian history task cards (with many ideas for narration assignments); they are in the CMCanada shared files. Many people have asked about H.E. 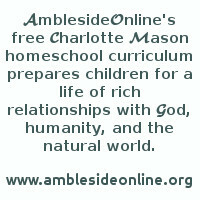 Marshall's Canada's Story, since her books on British and American history are already part of the AmblesideOnline curriculum. Although Marshall's writing style is interesting, the book itself is of limited value to Canadian students, and its scarcity would also make it difficult to recommend. The Baldwin Project is putting Marshall's Empire Story online, which contains Canada's Story; still it would be hard to recommend it as a core text. Because it was written for British children, only the period through 1763 is covered in much detail, making it useful only during the study of New France, in Year 2 or 3. The other difficulty with the book is its attitude towards Native Canadians; there are many references to "wild savages" and so on which would need to be edited out. Two other possibilities for Years 1 to 3 are George Brown's textbook The Story of Canada (not the book of the same name by Lunn and Moore), and Donalda Dickie's My First History of Canada, which has been reprinted and is sold through homeschool catalogues. Both are readable, "narratable" overviews of Canadian history, although neither covers the second half of the 20th century (this is not a problem since you would be choosing different books for Year 6 when that time period is covered). Two shorter/simpler overviews are The Story of Canada by Isabel Barclay, and The Canadian Story by May McNeer. (Is it a peculiarly Canadian problem that we can't seem to come up with any other names for our history books?) Both are out of print but they do come up regularly at library sales. Barclay's book is simply written, with large print, but covers our history only up to about 1900. The Canadian Story was published in 1958 in picture-book size; it has more difficult vocabulary, but also has great lithographs by Lynd Ward. A picture book similar in style to McNeer's, Cartier Discovers the St. Lawrence (by William Toye, illustrated by Laszlo Gal), is out of print but is well worth looking for. Paddle-to-the-Sea is included in AO Year 1 and teaches about the Great Lakes. A favourite at around Year 2 is Barbara Greenwood's A Pioneer Story. And because there's not much else like it for this age, we would also recommend The Kids Book of Canadian Prime Ministers, by Pat Hancock (Kids Can Press, in print). CMCanada subscribers have also mentioned the large hardcover book Spirit of Canada as a resource for the primary grades. CMCanada moderator Anne White notes, "It would certainly be useful to have a good collection of Canadian poems, legends and so on available; however, I would suggest previewing it through the library first before deciding if it's something your family will really use. My main disappointment with it was the illustrations, they're cute and colourful, but I think other Canadian art would have been more appropriate in an anthology of Canadian folklore and culture. (How about some real folk art, or Emily Carr's big trees?) We've found two other books that have been just as useful for our family: Canada's Story in Song, by Edith Fowke (out of print, but widely available), and Canadian Folk Songs for the Young, by Barbara Cass-Beggs. A wonderful online source for Canadian folk songs is The Great Canadian Tunebook. (The midi files are great fun to listen to.)" For a slightly older age group (Year 4 and up), two out-of-print two-volume textbooks seem to be good choices: Edith Deyell's Canada: A New Land / Canada: A New Nation, and George Brown's Canada in North America, Vols. 1 and 2. Brown's books are expanded versions of his Story of Canada, with more American history included (useful for the Year 4 or 5 timeframe). (Deyell's texts were originally intended for grades 7 and 8, and Brown's expanded texts seem to work for the same level.) My First History of Canada could still be used at this level as well. For Year 4, supplementary literature might include Madeleine Takes Command, reprinted by Bethlehem Books. The Incredible Journey, already on the AO list, is a Canadian book. A note from Anne: "I had my Year 4 read Longfellow's poem "Evangeline" (along with a recorded version), and The Diary of Mrs. Simcoe (notes on life in Upper Canada)." Those on the West Coast might be interested in Roderick Haig-Brown's The Farthest Shores, especially the parts about Captains Cook and Vancouver. (There are also chapters about Alexander Mackenzie, Simon Fraser, and David Thompson.) This book is fun to read because parts of it are written as radio scripts. Another possibility could be Ronald Syme's Alexander Mackenzie, Canadian Explorer. For Year 5, it would work to keep Abraham Lincoln's World as the world history text for terms 1 and 2, unless you have another preferred book. However, if you use a text such as George Brown's Canada in North America (vol. 2) or Edith Deyell's Canada: The New Nation, those do include some U.S. history too; so it's up to you. Another possible combination might be one of the Canadian texts plus Our Island Story (British history). There is a lot to cover in this period of Canadian history, including the War of 1812, the rebellion of 1837-38, responsible government, the Act of Union in 1841 (joining Upper and Lower Canada), immigration, pioneer life, etc. The first term of Year 5 would be a good time to read something by one of Canada's pioneering women writers: Susanna Moodie (Roughing it in the Bush), and her sister Catherine Parr Traill (The Backwoods of Canada, The Canadian Crusoes--see note below), or Anna Jameson (Winter Studies and Summer Rambles in Canada). We first heard of Canadian Crusoes in the Dear Canada book A Prairie As Wide As the Sea, but there it was called by its British title, Lost in the Backwoods. We found an old copy at the library, but later got a paperback reprint by Carleton University Press, with a wonderful introduction that tells a lot about the early education and later life of Catherine Parr Traill. (The CBC video "Sisters in the Wilderness" also tells the story of the sisters' early life in England and their struggles in Canada.) The story is about three cousins who get lost near Rice Lake, Ontario, and survive on their own for many months before they finally make it back home. Another very different book by Catherine Parr Traill is her Canadian Wildflowers, with paintings by her niece Agnes Fitzgibbon, first published in 1868. You can get a very nice paperback reprint through Lee Valley Tools. The second term of Year 5 should focus on Confederation, but might also include some history of your own region of Canada: for instance, the Underground Railroad, fur trading on the Prairies, the Fraser Valley gold rush, and the beginnings of the RCMP. If you've never sung "The Maple Leaf Forever", now's the time! You might also enjoy the songs "Pork, Beans, and Hard Tack" and "The Alberta Homesteader." Term 3 of Year 5 is the post-1875 period; that includes the Riel rebellion, building of the CPR, Sir Wilfrid Laurier's term as Prime Minister, and so on, up to (and through) WWI, if you can manage it this year. Literature might include one of Stephen Leacock's books such as Sunshine Sketches of a Little Town or Literary Lapses, both online at Project Gutenberg. Or you could read about the Klondike Gold Rush through Robert Service's poems. There were other very good Canadian poets writing around this time--look for Archibald Lampman, Bliss Carman, and Pauline Johnson (you can download her book Flint and Feather on Project Gutenberg). Another e-text to consider is (From) Ocean to Ocean by George Monro Grant (I've seen it with and without the "From"). It's described as "the diary of a keen observer who travelled with Sandford Fleming, across Canada in 1872 before the transcontinental railway was built." Rilla of Ingleside (dealing with WWI) is already on the AO list (as is Anne of Green Gables). This is also a good time to start incorporating more original source materials into history lessons: that is, speeches given during some of the events just mentioned and during political campaigns, and documents such as the British North America Act (which functioned as our constitution for many years). Thanks to the Internet, many of these documents are just a click away. The 20th century timeframe of Year 6 (Term 1 only, as the rest of the year focuses on ancient history) is probably the most difficult to make a recommendation for. The main (American) AO book for that year has become difficult to find and may be replaced; and that brings up the issues of inappropriate content and/or difficulty in reading level; plus there is the fact that the older books don't usually cover a good part of that time period, but the newer ones often have lots of pictures, little text. At the same time, this is one time period where there is a real need to cover events from a specifically Canadian point of view. Some compromises may need to be made for the history of the mid-to-late 20th century, perhaps by using more videos or magazines than might be ideal (though those would also need to be edited for content), or using Internet sources. Another alternative would be to end at an earlier point such as 1950 (where many of the older books stop), and work the later events into the high school curriculum. Some favourite miscellaneous books we wanted to include here (mentioned by CMCanada subscribers) are Farley Mowat's books such as Owls in the Family; Canadian Wonder Tales (Native legends, some of which were also collected in the book Glooskap's Country); and some of Jean Little's novels such as Look Through My Window and Mine for Keeps. Captain Marryat, the author of Children of the New Forest (read in AO Year 3) wrote a novel called The Settlers in Canada. The Dear Canada series has met with mixed reviews here...some of the books are better than others in both accuracy and literary quality. Since Year 7 is largely concerned with medieval history, that would be a year when many of us would take a break from Canadian history, though we might have the students start keeping a Current Events log. A note from Anne: "For Year 8, my oldest daughter will be reading Thomas B. Costain's The White and the Gold (Doubleday, 1954). This out-of-print book covers Canadian history from John Cabot up to about 1700, the same time frame as the other Year 8 books, and it is part of a series of history books written by other authors but edited by Costain. Francis Parkman's histories of this period might also be useful for year 8." And from Year 9 and up, the possibilities increase dramatically. The Chronicle of Canada series is online, including Mariner of St. Malo (about Jacques Cartier) by Stephen Leacock. (You might remember a library shelf full of those smallish, often musty volumes.) Pierre Berton's The Invasion of Canada is already recommended by AO when studying the War of 1812. In the areas of literature, communications, and media, Canadian high school students should definitely know about Marshall McLuhan and Northrop Frye. A note from Anne: "I'm considering (someday) using the book Canada: A Peoples' History, Volume Two (which was published as a companion to the CBC video series of the same name). It actually has some text to it (it isn't just a coffee table book) and it's written in a way that might help senior high school students make some sense out of the late 20th century. The only thing that irks me is that The Friendly Giant gets a mention in the index but Northrop Frye does not. Go figure." Also from Anne: "I read somewhere* that biography is something Canadians are particularly good at writing, so I am planning on having my own high schooler read several good adult-level Canadian biographies, beginning with Donald Creighton's 2-volume life of Sir John A. Macdonald. I'd also like her to read J. Granatstein's Who Killed Canadian History?, and possibly Pierre Berton's Why We Act like Canadians. We'll be reading Canadian Geographic magazine, and checking out any of the books reviewed there that sound interesting. The Great Canadians volume from the old Canadian Centennial Library (those flat red books from the '60's) has been a source of ideas for biographies and other books: it introduced us to historian Harold Adams Innis, Joseph Elzear Bernier (Canada's greatest sea explorer), and George Monro Grant." This magazine is a great way to stay current on ecological issues like water, energy, mining, forests, animals (did you know that the fisher, a member of the weasel family, is becoming a problem in parts of Canada and northeastern U.S.?) As an example, the 10th Annual Environment Issue (spring 2005) included articles on nuclear power, bioprospectors, Toronto's ravines, and a look back at environmental issues over the last decade. (Each issue also contains reviews of new books relating to Canadian geography.) The Canadian Geographic website contains the Canadian Atlas Online (with a section for kids), in-depth articles, and other reference materials. As with any mainstream magazine, there will be viewpoints taken that need to be contrasted with a Christian worldview (such as evolutionary assumptions). However, CG is still a valuable resource for learning more about our country and its place in the world, and, compared to the cost of geography textbooks, the price of a subscription seems like a bargain. Everybody knows about CBC radio, right? But don't think of it just as a place to listen to Bach and Beethoven for free (and opera on the weekends); it's also a showcase for Canadian orchestras, string quartets, jazz groups, composers, poets and much more. Where else can you hear an annual Christmas production from St. John's, jazz in Montreal, and then be taken to live concerts in Poland and the Czech Republic? As with anything else, the usual cautions on content apply. You can check the CBC website to see what's coming up that you might want to listen to with your children. One of our favourite programs is Sound Advice with Rick Phillips, which reviews and plays segments from new classical CDs; it's our weekly music appreciation course during Saturday lunch. Many of us are great fans of library sales and used book stores (and their online counterparts such as abebooks. There are often great imports and remainders in the monthly Hampstead House catalogue. For new books, homeschool catalogues that carry quite a few AO titles include Tree of Life and Canadian Home Education Resources, but other catalogue vendors do carry at least some of the books you might be looking for (or they can order things for you). We have labels stuck to the four walls of the room--North, South, East and West. We added labels to the proper walls for sunrise, sunset, and the towns to the immediate north and south of us. My daughter practices running to the right wall when I call out "north" or "sunrise" or whatever. We'll probably add some more difficult labels such as "to the Arctic Ocean" as she learns more. I made an outline map of Canada on a piece of poster board. This wasn't quite as difficult as I thought it would be; I bought poster board that is marked in faint squares, and I squared off a smaller map of Canada and used it as a guide. I did not mark it off into provinces; I wanted to keep the idea of the country as a whole. When we have the map flat on the floor, we make sure the top is pointing towards the north. We read the first chapter of the book (they are short chapters), talking about where the first Native people came from, and we walked a small doll all over the map from Alaska across to the east and down to the south.